Stephen Drury rehearses pieces, by Georg Friedrich Haas, on two pianos, tuned a quarter-tone apart, at The New England Conservatory. He was talking about the Summer Institute for Contemporary Performance Practice, abbreviated SICPP and known, with colloquial affection, as Sick Puppy. 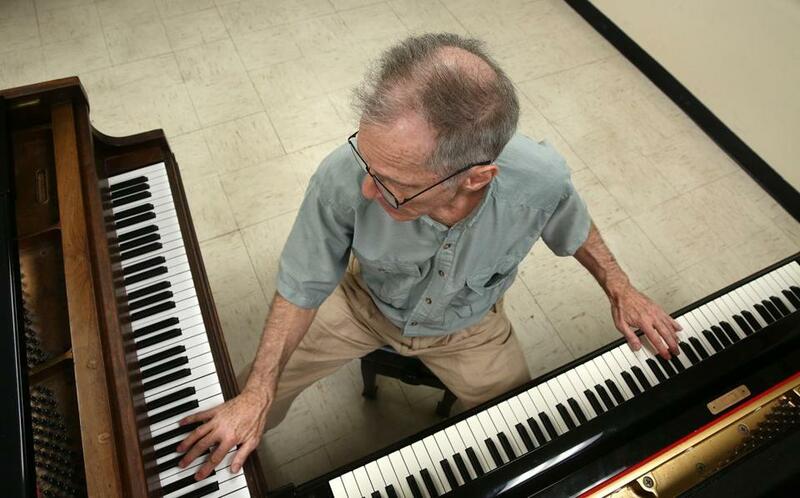 It is an annual new-music lollapalooza that Drury has been hosting for more than two decades at New England Conservatory, where he is a longtime faculty member. Along with a deep dive into various specimens of the avant-garde by the institute’s fellows, guest artists, and faculty comes a week of free concerts whose programs not only enliven Boston’s musical landscape but also allow audience members a glimpse of Drury’s creative process, shot through with inadvertence though it may be. Take this year’s festival, with composer in residence Georg Friedrich Haas, a composer whose exploration of microtonality — the notes that fall between those of our familiar scale — has yielded a rich harmonic language that he wields with extraordinary emotional power. As Drury, a pianist, was studying Haas’s oeuvre, he discovered three pieces written for one pianist playing two pianos tuned a quarter-tone apart. How difficult are they? Drury, no stranger to composers’ outsize demands, called playing them “this act of masochism I’m putting myself through.” He was only partly joking. Still, the Haas pieces put him in mind of Charles Ives’s “Three Quarter-Tone Pieces” for two pianists playing the same instrumentation, a modernist classic. And why not add to the canon for this combination? So he organized a co-commission, with the Tanglewood Music Center, of new pieces by composers Rand Steiger (a former SICPP composer in residence) and David Fulmer. Elsewhere on the concert programs there are, of course, plenty of works by Haas, whose music Drury extolled not only for its unique harmonic language but for what he called its “real heart and soul and fist-clenching truth,” using terms not always applied to what can be formidably complex scores. He speaks in the same way about “Kontakte,” a 1960 piece for piano, percussion, and electronics by Karlheinz Stockhausen. It is a high point of Stockhausen’s embrace of “total serialism,” in which a strict ordering scheme governs nearly every aspect of the piece’s construction — harmony, rhythm, dynamics, etc. That description can make “Kontakte” seem more machine than art. As in past iterations of SICPP, this year’s festival will end with Saturday’s Iditarod, a marathon concert that begins at 4 p.m. and ends whenever the music runs out, which is often the following morning. The guiding idea, Drury said, is “too much is never enough. He was reminded of the Iditarod in 2012, the year that marked the centenary of John Cage’s birth. Because Cage’s music is a lodestar for Drury, the program was extra-long, and the concert ended after 3 a.m. Then it was time to put instruments and equipment away and eat pizza with the musicians. Finally Drury and his wife, pianist Yukiko Takagi, got into their car. Takagi told him they couldn’t leave yet. Drury couldn’t believe it — they were both beyond exhausted. Drury looked at the clock in the car. It was exactly 4:30 a.m. In three minutes it would be 4:33, the title of the epoch-making piece that made Cage into a legend and permanently altered the art that followed in its wake.